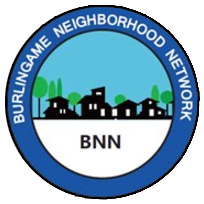 The Burlingame Neighborhood Network encourages neighbors to connect with one another to build a sense of community, become informed about disaster preparedness and support one another during emergencies. Their sense of community fosters a “Neighborhood Watch” awareness that helps prevent crime. It’s not a question of if but when a major earthquake occurs in our city. When the Big One happens, emergency responders warn that we’ll be on our own for three to seven days. Studies of major catastrophes have found that personal connections among neighbors dramatically improve chances of survival during a disaster and recovery in its aftermath. That’s why the Burlingame Neighborhood Network (BNN) encourages neighbors to get to know one another by hosting block parties and casual get-togethers. Many Neighborhood Network groups create neighborhood directories and newsletters to facilitate communication. Some gather details on skills and supplies that neighbors have that can be useful during a disaster, as well as special needs, such as residents with limited mobility or pets that may be left alone during the day. Founded in 2006 by community volunteers, BNN can help you start a group in your neighborhood by assigning a mentor to walk you through the process. We host quarterly meetings on topics of interest that are open to everyone, and we work closely with Burlingame’s disaster preparedness and crime prevention personnel to coordinate activities. Our biggest event each year is the annual Citywide Emergency Drill, where neighborhood groups respond to a simulated disaster and learn how to protect their families and help one another. If you would like more information about starting a Neighborhood Network in your Burlingame neighborhood, or if you’d like to participate in the Citywide Emergency Drill, email: info@burlingamenetwork.org. Our Burlingame Neighborhood Network Board of Directors invites you to join us in helping Burlingame residents get connected and get prepared. To reach the entire board, email: info@burlingamenetwork.org.